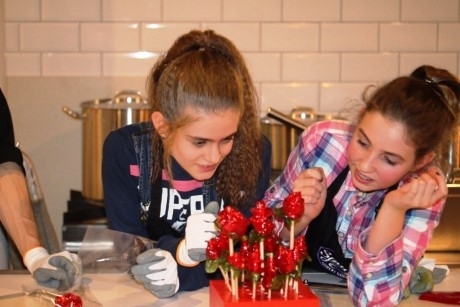 Key Stage 2 to 5 school groups can learn all about the History and Science behind confectionery making in the purpose built kitchen of Spun Candy, in central London. The confectioners offers a special workshop for school groups, available in the afternoons, Tuesday through to Friday. Suitable for pupils over age six and linking to Food Technology, History and Science, the workshop can also be tailored to particular areas of national curriculum subjects, including Physics and Chemistry. What does each workshop include? The interactive classes see children discover ‘the magic of candy making’. Sweet making is a skill which dates back thousands of years, and pupils will get to learn about the history of the formation of candy, plus discover the skills behind its creation by watching demonstrations first hand. Each school workshop lasts around 90 minutes and includes a welcome soft drink (water or squash); a short introduction by one of the master candy makers on the art of sweet making, including an educational video; and a candy making demonstration. What follows is a hands-on creative session where each participant gets to make their own rainbow swirl lollipop. The group will then take part in a confectionery quiz to test their new found candy knowledge. The confectioners welcomes school groups of 20 to 30 pupils at a time. To make a booking, call 020-7377 2419, or e-mail parties@spun-candy.co.uk. Spun Candy is part of the TFL (Transport for London) school transport scheme, which means free travel is available on all London networks for schools (including bus, tram, DLR, London Overground as well as TFL London Rail services within zones 1-6). For further information visit www.spun-candy.com/school-workshops.